DSSSB has released the DSSSB PRT Syllabus and Vacancies for PRT posts in the government schools. The DSSSB is regularised body which looks for competence in the government services in the state. Aspirants of DSSSB should note that the competency level for PRT examination is very high and that they need to be full in command of the syllabus if they wish the conquer it fully. In the following article about DSSSB PRT Syllabus , we have compiled the syllabus for the Hindi Language and Comprehension which is one of the most important and awarding sections of the examination. A candidate must complete the syllabus of Hindi if they wish to score high in the examination. check out the syllabus, exam pattern and the preparation tips in the following article. 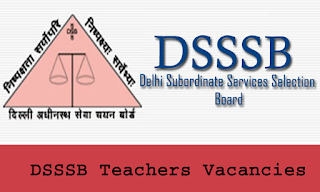 · Know the Syllabus: The candidates aspiring for the DSSSB Exam must know the DSSSB PRT Syllabus for the exam. Knowing the syllabus helps as much as knowing the enemy in a war does. You can easily leave the topics you are weak in for later and give more time to those topics which you are confident of to prepare better and score more in the DSSSB Exam. · Save Time, Attempt More: The Candidates should learn and use effective time management tricks to use their fixed time judiciously in the DSSSB Exam. The short tricks and tricks if solving questions will help a big way in the long run. Candidates should not waste time in solving one questions and focus on solving as many questions as possible. In this candidates are advised to see that they only answer questions they are sure about as there is a scope of negative marking. · Solve previous year question papers: The candidates should try to solve as many previous years question papers along with model or practice papers. This will help the candidates to get set for the exam mode and let them know the level of the question paper. They will also be able to know the type of questions that will be asked in the exam. Candidates can also practice to solve them according to the actual time limit allowed in the exam as to get the idea of time management in the exam, judge their performance and improve their speed. · Solve sample paper: Sample papers are the best way to revise and practice all the concepts studied by the candidates while preparing for the DSSSB Exam. Solving the DSSSB Sample Papers will help the candidates to get set in the exam like the environment and also boost their confidence.